This expansion to the iBook Logic Board Repair Extension Program is the inclusion of certain additional iBooks to the existing program. The Expanded iBook Logic Board Repair Extension Program is a worldwide program covering repair or replacement of the logic board in iBook models manufactured between May 2001 (the original "dual USB" all-white iBook) and October 2003 (when the last G3 iBooks were discontinued) that are experiencing specific component failures. The original program began on January 28, 2004. This expansion, which adds certain models, is effective immediately. The program covers affected iBooks for three years after the first retail sale of the unit or until December 18, 2004, whichever provides longer coverage for you. Apple will continue to evaluate the repair data and will provide further repair extensions as needed. The repairs outlined in this program, including shipping charges, are covered at Apple's cost. Either an Apple technical support representative or an Authorized Apple Service Provider (AASP) will determine if the component failure identified for the Expanded iBook Logic Board Repair Extension Program affects your computer and, if so, arrange for the repair. If your iBook is eligible for this program, it will be repaired at Apple's cost, including shipping charges. Repair may include repair or replacement of the main logic board. To participate in the program, call the appropriate Apple Contact Center for the country in which you are located, or contact a local AASP. The U.S. support number is 1-800-275-2273. We all love the WallStreet, but sometimes it's a bit slow. Wegener Media has decided to overhaul the old WallStreet with their new Avanti 417 MHz and 400 MHz G3 processor upgrades starting at $139.99. Good for Mac OS 8.1 through Jaguar! "Good question. But think about it. The only real advantage of G4 is the AltiVec processor, which is rarely utilized except for video processing. And the WallStreet is really not set up for video processing anyway, so if you were going to do video, you'd save that extra $150, and get a Pismo. So our opinion is, get the Allegro, save your pennies, and get on with life! "The bottom line is, will this thing function? The answer is yes! We have been able to reduce processor heat by nearly 50% cooler than even the G3 PowerBook Pismo! Our processor operates at a balmy 50C (that's 121F for you Americans!). And cool is good - this means great reliability for your processor, and excellent performance for you! "Since our system upgrades don't require ROM updates, software installation, or any other drivers, you're guaranteed complete 100% computability. No need to install any software at all! Just plug in the upgrade and restart your computer! Many folks who've bought upgrades requiring ROM installation have experienced problems, requiring them to return the units for reworking. By comparison, our upgrade utilizes the original Apple ROM, therefore completely bypassing the ROM issue and guaranteeing you complete hassle-free service! "Take a multigigahertz processor, add heaps of RAM, attach at least a 15" flat-panel display, and put it all into a laptop. Now you're working with power. When it comes to computing on the road, slim is in. But sometimes you need more oomph. "Mac users aren't left out of the desktop replacement option. Graphics and design entrepreneurs who don't want to skimp on their Apple laptops can look to the PowerBook G4's 17-inch screen, backlit keyboard and slim 6.9 pounds." The world's only graphics card for PowerBooks connects additional High End Displays. All VGA, DVI and ADC Displays are supported. 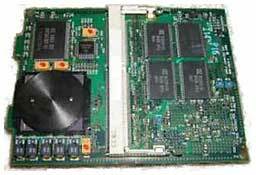 Village Tronic's new VTBook PC Card graphics card for PowerBooks works in any Type II PC Card slot equipped PowerBook, such as PowerBook G3 WallStreet, Lombard, Pismo, or 15"-17" PowerBook G4 running Mac OS 9 or Mac OS X. Any VGA, DVI, or ADC display (with a DVI-to-ADC adapter) is supported. Additional display space is ideal for those PowerBook users who need an easily transportable notebook but also need to use a full-size display when sitting at a desk. Road warriors, video and audio editors, programmers, creatives, and many other PowerBook users will find the additional display space invaluable in order to maximize productivity. VTBook supplies more than simple video mirroring - it supports a complete additional display. Windows can be dragged seamlessly from the PowerBook's display to the external monitor. For PowerBooks without a DVI connector, VTBook is the only way to connect the high end ADC Displays. PowerBook users can get resolution as high as 1920 x 1440. VTBook's independent 32 MB of 266 MHz DDR memory ensures no impact on the PowerBook's performance, even when running in the highest resolution modes. VTBook supports more than 70 predefined resolutions from 512 x 348 through 1920 x 1200 at millions of colors. VTBook is hot swappable under OS 9 and OS X 10.3, and it supports Deep Sleep and Hibernation. 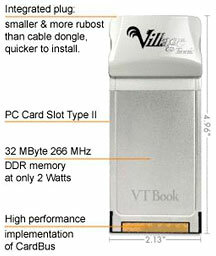 VTBook ships with a DVI connector as well as a VGA adapter and comes with a stylish magic box carrying case. "The VTBook is exactly what many PowerBook users have wanted for years. Now it's very easy to attach an additional external display to your PowerBook, drive it in millions of colors, and get the extra desktop space which before only was available to a desktop system," said Hubert Neumeier of Village Tronic. "VTBook is the only solution if you want to connect your high end ADC Display to your G3 PowerBook or your second external display to your 17" PowerBook." VTBook is the perfect choice to enhance the graphics capabilities of modern and less modern PowerBooks. A better graphics engine means more working space to improve your productivity while working at your desk with an external display. What is a common practice on desktop is finally possible on notebooks, too: Plug in the card and enjoy a big display on your portable computer without the need to change machines. There are few competitive products, such the Margi Display-To-Go PC Card (SRP $224). They support only 4 MB of video memory and much lower resolutions. VTBook is the only CardBus graphics card that offers both VGA and DVI in one product and runs on a modern OS. Hardware Requirements: PowerBook with a CardBus slot, including WallStreet, Lombard, Pismo, titanium 15", aluminium 15" and 17"
"MTI MicroFuel Cells Inc. on Monday (June 21) unveiled patented direct-methanol fuel cell (DMFC) technology based on what the company says is a radically simplified architecture that will permit handheld electronics to be powered by integrated, internal fuel cells for the first time. "MTI Micro is due to demonstrate prototypes of handheld systems that enjoy three to 10 times more "on" time than conventional lithium-ion solutions using its Mobion DMFC technology. "Vast developments have been made over the past year in terms of slimming down fuel cell sizes to attach directly on the portable device, but it has been an ongoing challenge to develop a fully integrated power solution," said Sara Bradford, an analyst with Frost & Sullivan. Indeed, many fuel cells "clip" onto the device they power from the back or side, or else reside in a separate unit that plugs into it, she said. "Smart Fuel Cell AG and Medion AG have demonstrated a notebook PC docking station powered by a fuel cell, she added, but MTI Micro is the first to introduce an integrated micro fuel cell solution." The Milano leather case is as slim and full-featured as your new PowerBook. This high-quality leather case is geared to the executive who wants a slim, stylish case for business use. Crafted of high-quality cowhide leather, the Milano comes in a 12", 15", and 17" version to ensure a custom fit for all PowerBook models. The 12" and 14" iBook also fit nicely in the respectively sized cases. The Milano is a tight design that avoids the bulkiness found in most other cases. Price: $139.95, available from the Think Different Store. RadTech has announced immediate availability of several new product additions. Following on the success of the svelte PodSleevz iPod cases, miniSleevz inherit the same features as their larger siblings. Constructed from RadTech's unique Optex fabric, miniSleevz provide full, wrap-around protection while adding minimal bulk. As with their larger counterparts, miniSleevz allow full control of the iPod mini directly through the case, fully shielding the click-wheel navigation control from soiling, spills, debris and dirty hands. As with all of RadTech's Optex iPod sleeves, a miniSleevz-clad iPod mini fits perfectly into the Apple-supplied belt clip and armband mounts. MiniSleevz are available in six vibrant colors, both online, and wherever RadTech products are sold. Priced at $17.95. A professional-grade notebook enclosure, designed to be the most rugged and functional enclosure available for both transporting and using late model PowerBooks. Only slightly larger than the PowerBook itself, the MacTruck enclosure can be carried by itself, or it is easily stowed into a conventional bag, backpack or suitcase. Constructed from 3 mm thick 5052-H32 aluminum alloy and weighing 4.5 - 5.5 lbs., the MacTruck provides complete notebook protection under the most severe conditions imaginable. The enclosures are uniquely sized for each model Apple portable, add minimal bulk, and allow complete use of the notebook without removing it from the enclosure. The enclosure provides full access to all ports, optical drives, and controls. The opened case can also be manipulated to provide slight chassis inclination for more ergonomic keyboarding. The cases feature a durable powder-coated finish, finished by an epoxy clear coat. Available in two handsome hues: aluminum and graphite. Price range: $199 - $229. iBook models will follow soon. This ruggedly built, mobile-sized, and lightweight Bluetooth wireless mouse packs a solid productivity punch. The BT-500 combines 3-button functionality and control as well as a finger-friendly silicone composite scroll wheel. Weighing a luggage-friendly 64 grams with it's included AAA alkaline batteries, the mouse ships in RadTech's environmentally responsible and reusable Tough-Pak - the perfect cocoon for stowing the mouse while on the go. Battery life is enhanced thanks to the BT-500's smart, power-saving sleep mode - when the mouse is moved after switching to sleep mode, the connection is seamlessly restored in two seconds! An easily accessible power switch allows the device to be powered down for extended periods of nonuse. Battery life is a respectable 7 days when powered on 24/7 and several weeks when used 4-6 hours per day. The BT-500 wireless mice are available in both blue and white colored exteriors for $54.95. A complete line of soft luggage and cases designed expressly for conveying Apple notebooks and iPods in style. Backpacks that accommodate the entire notebook size gamut, including Apple's 17 inch PowerBook. The backpack line features multiple padded pockets and compartments, as well as top-grade hardware and materials throughout. 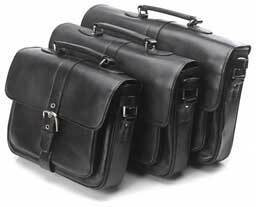 A wide selection of shoulder/messenger cases that are uniquely tailored specifically for Apple notebooks, as well as a selection of machine-specific, formfitting Neoprene sleeves. Stylish and innovative accessory and roller cases round out the notebook case offerings, as well as a unique and exciting line of iPod and iPod mini cases and enclosures. Most of the cases feature self-repairing and waterproof zippers, as well as an innovative sound port which allows an iPod to reside inside the case, while the ear bud cable is neatly routed through and outside of the bag. The entire line is available today, with prices ranging from $15.95 to $134.95. A list of worldwide dealers is available online. The PocketDock Combo offers USB and FireWire ports in a package hardly larger than the original PocketDock. It accepts industry-standard USB 1.1 or 2.0 cables and 6-pin FireWire cables, allowing the user to connect to Macintosh and Windows systems at will using one convenient adapter. Just like the original PocketDock, the PocketDock Combo is smaller than a box of matches and is compatible with all iPods featuring the Dock connector, including the new iPod mini. When you're on the road with your iPod, listening to your favorite hits, you may unexpectedly want to connect to another Mac or PC. When you need it most, you'll probably find that you didn't bring the special iPod docking cable - it's at home connected to your computer. Since you can find USB cables almost anywhere - just unplug a printer or scanner - the PocketDock Combo let's you get connected anytime, anyplace. Charge your iPod's battery from any powered (6-pin) FireWire port, found on all current Macs and many PCs. The iPod mini can also be charged from a high-power USB port. PocketDock Line Out offers the same 6-pin FireWire connector as the original PocketDock but adds an industry-standard 3.5 mm (1/8") stereo jack for high-quality audio output. The stereo jack connects directly to the iPod's line level circuitry, bypassing the iPod's headphone amplifier for optimal sound quality when connecting to an external amplifier or stereo system. Just like the original PocketDock, the new PocketDock Line Out is smaller than a box of matches and is compatible with all Apple iPods featuring the Dock connector, including the new iPod mini. This makes the new PocketDock with Line Out an ideal accessory for professional DJs, HiFi enthusiasts, and anyone else who would like to take the iPod's great sound quality to its full potential anytime, anywhere, without interference and distortion from the headphone equalizer and amplifier circuitry. Mobile FireWire and Audio connections - more convenient than ever with the new PocketDock with Line Out. The PocketDock Line Out Pack includes two 6 ft. ultralight and ultra-compact white audio cables: One with 3.5 mm (1/8") stereo plugs on both ends, one with stereo RCA and 3.5 mm plugs. They are slim enough to fit into the palm of your hand and come with detachable Velcro straps for convenient storage and cable management. Their beautiful design is a perfect match for both iPod and iPod mini - just like the PocketDock itself. IceWear is a beautiful, strong, and light case/cover for your iPod mini. Compared to traditional silicon cases, it uses the same silicon found in diving masks to make sure that Apple's beautiful creation does not get converted into an ugly looking product. The wear, as TuneWear likes to call it, allows access to vital controls while at the same time adding functionality in the form of features such as a belt loop. The ribs on the side glow the product in the light to add beauty to iPod mini as well as protect it during falls. IceWear is so strong it will protect your iPod mini from most any condition. Unexpected clutter in unexpected places causes invisible scratches on your gadgets. With IceWear you can just throw it in the bag and move on without any worries. Keep your iPod mini looking like new, even after rigorous use. Even with IceWear, your iPod mini has all ports open for easy access. Headphones, remote, bottom dock connector, screen, and wheel control are all open for easy control and access. The top area is flush with the profile of iPod mini, so third party products such as the iTrip mini can be attached without having to remove IceWear. IceWear does not cover the wheel or screen. Rather it is intentionally left open for complete control and view. That is the way AppleDesigned the iPod mini and that is the way we leave it. The screen is protected by embossed edges so that it does not get scratched. IceWear is made of very strong silicon with a belt loop so that you can put it on your waist belt or shoulder carry bag without any additional clutter. The belt loop also acts to keep your iPod mini cool, so it can function without any errors. IceWear is made of high clarity transparent silicon. It is the same kind used in diving masks and does not cause any skin irritation. It is only 1 mm thick and GLOWS the iPod mini to make it look beautiful and radiant under light. It is more ultralight than other cases and is a simple yet very functional design. The IceWear and TuneWear logos respectfully do not cover up the Apple iPod logo. Also the IceWear logo and TuneWear logo are embossed in perfect symmetry. High-density silicon, so any ink or pen marks can be removed with the swipe of a hand. And better yet, you can even use soap and wash it in the sink to make it look like new after rigorous use. IceWear has a shock absorbing rib on both sides of the case. A drop from your desk can damage the delicate iPod mini's aluminum shell, but when protected with IceWear, damage to iPod mini will be none or minimal. The rib also functions as a better grip for the iPod mini in your hands. There are 7 ribs on each side with a total of 14 to protect your iPod mini. So at whichever angle the iPod mini falls, the likelihood of the rib protecting your iPod mini is quite high. The rib also acts as a slipstop mechanism. The gripping power of this product is just insane. Travel on a bumpy ride by air, sea, or land, or just go to sleep, and you will find it where you left it. Airline travel is a good example, because you constantly have to manage a very limited space with your food and drinks. Have you ever had your PDA or audio player slip between the seats and fall on the floor during a flight? Not with IceWear; it will stay put.